Prior to the birth of our son, Umar Khalif, I had always thought that besides our baby demanding for his hourly feeds, he will be sleeping soundly or cooing playfully in his cot. Little did I know that at some point, all he wanted was to be carried and sometimes, for the whole day! Sticking to our personal beliefs, we have mutually agreed that we will adopt “attachment parenting” and soothe a crying baby as soon as possible. Well, just try to imagine yourself in a world totally foreign to you. You will need something or someone that is familiar to you to make your transition to the foreign world smoother. Likewise a newborn baby who is suddenly introduced to bright lights, noise and lots of movement will need the similar feeling he had for 39 weeks prior to his birth. However, as a parent, you will soon meet difficulty doing simple daily tasks like having breakfast or placing used cups into the sink. How do you carry out attachment parenting while keeping your own daily survival & sanity in check? Well, babywearing made it possible. To date, I have owned six carriers! I will review each of them in this blogpost in the hope that someone will find it useful and would not be as bewildered as I was with the array of carriers available. So even if this blogpost is useful to 1 person, just 1 person, then I’m grateful. The next I purchased was the BabaSling in scarlet red. I used this for longest period of time. It was specifically purchased for home use. I truly feel that this is a good starter sling for newbies who know nuts about slings. It comes with TWO adjustable clips and easy-to-follow instructions. Once you get the desirable height, you don’t need to change it anymore unless of course, another person wants to use it. You can just plonk your baby in. Not only that, I love how comfortable the material is. It is truly perfect for our humid weather. It also comes with a thick shoulder pad to cushion the weight. The material is sturdy that you can have both hands free without worrying about your child falling backwards. But of course, you are advised to have a hand at the back at all times to prevent accidents. Then after many months, I did an impulse purchase – Balboa Sling. I have always wanted to own a ring sling and I happened to saw a picture of a friend carrying her baby in what looks like a ring sling. 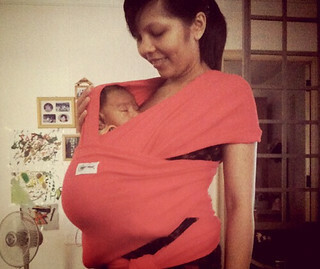 Not only that, the design was very beautiful and looks similar to the Baba Sling I had then. I mean, who can resists pretty items right? Just so happened that another friend of mine was heading to Mustaffa Center where the Balboa Sling was available, I gleefully asked her to grab one for me. I mean what could be wrong if it’s a sling endorsed by Dr Sears. Well, Umar Khalif was already 1 year plus then and he is not the little baby with minimal movements anymore. The material is comfortable and the design is appealing to the eyes. It is soft but not sturdy when worn. It is pretty impossible to go hands-free unless I wanted to risk active Umar Khalif falling backwards. 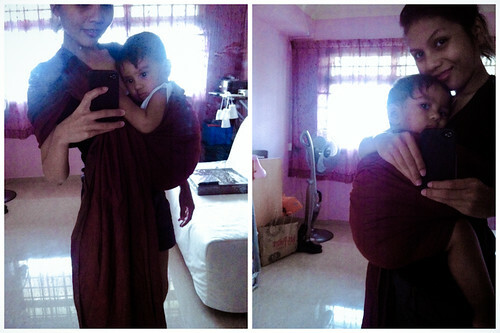 I suppose the sling is not suited for active toddlers. Not forgetting my recent purchase – a ring sling from CareringSling. My sister had mentioned to me this website before but I was skeptical at first. One day, I attended an event organized by BMMSG where CareringSling was one of the vendors. It was truly love at first sight. Remember earlier I mentioned how I really wanted a ring sling? Well, it is a ring sling and the material is so gorgeous, I. JUST. HAD. TO. PURCHASE. ONE. 😀 Furthermore, it is “endorsed” by my sister, making the purchase even more justifiable. Apart from the material being gorgeous and stunning (hehe!!! ), it is easy to wear, wash and is comfortable to both mommy and baby. Definitely suitable for our humid weather. 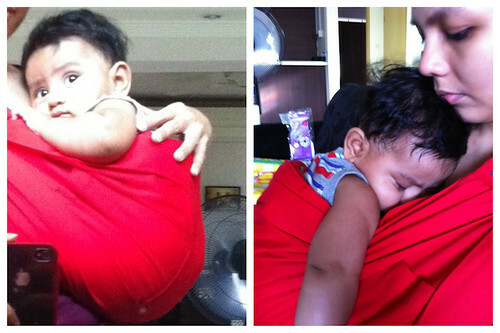 At 15 months, Umar Khalif still has days where he just wants to be carried and I must add that this holds Umar very well without the risk of him falling over, should I need both hands to do something. 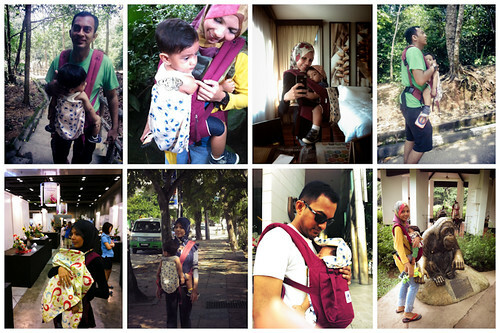 Of course, the best of the best that we have since he was 2 months old and still use frequently for our outings and holidays is the organic Ergobaby Carrier. It is easy to wear especially when I am alone with him. It doesn’t put any pressure on the hips or shoulders. Now that Umar Khalif is weighing over 10kg and the fact that we only bring this carrier along says a lot about the durability of the carrier. Not only that, it is easily adjustable, meaning that swapping duties is not a chore at all. Plus, it especially great for breastfeeding mothers. All I need to do is to loosen the buckles to adjust the strap and I am good to go. The material is comfortable and you can wear it for long hours without bathing in your own sweat. Till today, Umar Khalif loves being in it. I am not exaggerating when I say this. When he is cranky, all I need to do is to put him in the carrier and he is immediately soothed.